Internal Fire Museum of Power01239 811212work Museum - IndustrialThe Internal Fire Museum is a small museum dedicated to the history of the internal combustion engine in industry over the last 100 years. The collection covers early oil engines through to gas turbines but with the emphasis on diesel power from the 1920s to the 1960s. Exhibits are displayed in as near to the original working environment as possible so that vistors can see, smell and hear what these engines did. The Internal Fire Museum is a small museum dedicated to the history of the internal combustion engine in industry over the last 100 years. 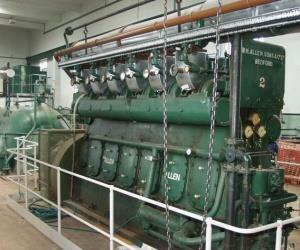 The museum runs engines 7 days a week during the summer months and by arrangement in the winter period. 5 April - 31 July & 1 September - 31 October 2017: Open Wednesday - Sunday 10:30 - 17:00. Castell Pridd Farm is 8 miles north of Cardigan just off the A487 Cardigan to Aberystwyth main road.We are just to the north of the village of Tanygroes, 300yds down the Betws Ifan road. Castell Pridd is marked on the OS Map for Ceredigion.